It's been a busy week here getting ready for the Red Line Yarn Crawl. Ginger and I dyed yarn on Tuesday and it was the first time this season we could hang it out on the fence. A fence full of yarn always makes me so happy! I really feel like I've accomplished something. All week, we've been working on samples for the grab bags. I've been calling it the Yarn Crawl Sweatshop around here. They are finally done, though. Each of these has samples of yarn that you can try and two great coupons from local bodyworkers who are dedicated to keeping you knitting! The fun starts at 10am tomorrow. Hope to see you there! My beautiful sign got stolen over the weekend. It was very carefully removed from the posts and taken sometime during Friday night or Saturday morning. I have informed the police. The nice detective told me that there are people who collect retail signs and if they see one they like, they just help themselves. The bottom line here is that I have to replace the sign and that kind of money is not in the budget right now even if my insurance comes through with some of it. Patience (JPatience on Ravelry) has come up with a fun way to raise some money similar to the "guess how many jelly beans are in the jar" game. She is in the process of organizing and cataloguing all of her knitting books. For $5, you can take a guess at the total number of knitting books she owns (even she doesn't know at this point). The three closest guesses get to pick a skein each of Mind's Eye Sock Yarn from her stash pages. The closest guess gets to pick first, second closest second and third closest third. Get your guess in by Friday, March 16th and we will announce the winners on Monday, March 19th. You can come by the shop to register your guess or you can use Paypal. If you pay by PayPal send money to lucy@mindseyeyarns.com and include your guess in the note to seller. Hint: Patience has gotten through authors A-C and has counted 38 titles so far. Thank you for any help you can give. People's response has been so heartwarming. I will probably be replacing the sign with something smaller, attached to the house and, hopefully, less easy to steal. I am attempting to fire up the blog again and what better way than to tell you about all the fun we had on Rock Day, January 7. This is our first customer of the day with her drop spindle! Rock Day, otherwise known as St. Distaff's Day is the day after Epiphany and was traditionally the day that spinners in Europe took up their spindles again after the Christmas holiday. In the last few year, spinners have adopted January 7 as a holiday to celebrate our craft. It has taken me a few years to get on the bandwagon, but this year I put it on the calendar and I hope to make it an annual event. I was so excited about the kids that came out! These two are going to be fine spinners! I demonstrated the wheel while others brought their own. And others got to try a wheel for the first time! We even made drop spindles out of random things. FYI, a bamboo skewer stuck through either a fingerling potato or a radish makes a really slick drop spindle but a brussel sprout doesn't work as well. Too leafy and not solid enough, I guess. All in all, we had a great day and will definitely be celebrating again next year. I just looked at the date of my last post and it's been over a month! I think that's a reflection of two things. One is that my knitting hasn't been that interesting, just a progression of stockinette stitch socks. The other is that the shop is starting to get busier so I have less free time. I'm still in sock land. I'm getting ready to mail my cousin's wife a tape measure in hopes that she will finally get back to me with some measurements so I can start his vest. Meanwhile, I've done my Christmas knitting list. It's not as extensive as last year's but I still need to hit it hard. The first things I need to complete are the things for my friends Andrzej and Kathy. They live in Hong Kong and it's going to take about a month for their presents to get there. I'm making Andrzej a pair of grey socks (sad face). Andrzej used to be the guy I could count on to wear any kooky, colorful pair of socks I made him. Now that he's in Hong Kong, he's teaching at a temple where the guilding teacher wants everyone to dress in monastic clothing. He's had to put away all his fun socks in favor of white and grey. So, I'm knitting him a pair he can actually wear. I had some left over grey alpaca from a scarf I knit for a monk friend of mine last year so I'm going to knit Kathy a lace scarf with that. That, at least, should be fun and she'll be able to wear it at the temple. I think I'm going to use the Fiber Trends Estonian Flowers pattern. In addition to those gifts, I've got another vest, eight pairs of socks, several hats, a neckwarmer, a baby sweater and another sweater for my sister (she promised to pick an actual color this time). It's a big list but I'm pretty sure I can get it all done, if not by Christmas, at least by mid-January. I was in the front room knitting while a couple of women with an infant and three year old were browsing in the other room when I heard, "Mommy, can we move in here? 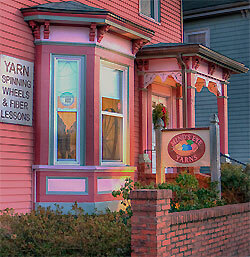 'Cuz then we wouldn't have to drive all the way here when we wanted yarn." Sorry for the lapse. I'm knitting a bunch of shop samples right now. The vest for my cousin is still on hold until his wife gets me some measurements. I just finished a baby set out of the Cascade 220 Superwash Paints (photos coming soon) and a hat out of a new super bulky Platino. I'm knitting a hat out of the Malabrigo Rios even though our supply of that is pretty low. Hopefully, we'll be getting more soon. I ordered it. It's now up to Malabrigo to send it and we all know how that goes. It's always great fun working with the new yarns! The next UFO I've dug up is a vest from handspun that was a victim of the great knitting stoppage of 2009. This happened last year in October when I irritated a nerve in my shoulder and had to stop knitting for a couple of months. What I learned from it is that I cannot continue knitting past the point where my shoulder begins to hurt. I need. to. stop. If I do that, I can knit again after a break. If I don't, bad things happen. Unfortunately, the stoppage came right when I was in the middle of my Christmas knitting. I've almost caught up from it in time for this Christmas! This is the yarn I'd spun so far and the remaining fiber. I also had a couple of bobbins full of singles that just needed to be plied. I've since plied what I had and spun and plied the last of the fiber. I've got nine skeins of two ply yarn that are about 4oz each and will probably knit at around a heavy worsted weight. I might knit them a bit tight since it is for a cousin of mine to wear when he's working outdoors in the winter. This is my cousin who got pneumonia two winters ago so I'd like to get this done for this winter. There's one fly in the ointment, though. I've lost his measurements. I emailed his wife and she said she'd get them but she's got two children under four so it may take her a while. I must remember to never write measurements down on little pieces of paper. I inevitably lose them. I have a measurement book for a reason. I've got to always use it! Meanwhile, I really should wash all this yarn and I can always swatch while I wait for measurements.